Directions are listed below in various formats. You may use either parking lot: Pine Street area lot or Maple Street area parking lot. There are multiple entrances to the building(s). For Sunday mornings, the doors are unlocked after 8:40 am. At other times, the "Connector" Doors will be unlocked for scheduled meetings and events. For the safety of the children in the Early Learning Center as well as all who enter our building, you may find the other doors locked. Please use the connector entrance. Church members and Early Learning Center parents will have access by way of a fingerprint scanner. There is also a phone intercom system to page someone to let you in if needed. We are in the Tree Streets Historic District of Johnson City. Take the ETSU/ELIZABETHTON Exit #24 (US-321, TN-67). Turn left onto US-321 S (TN-67 W, Milligan Hwy) (0.3 miles). Turn right onto S Roan St. (0.6 miles). 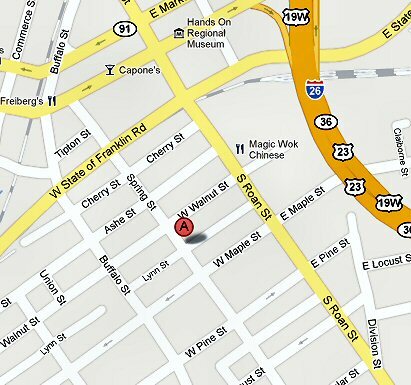 Turn left onto W Maple St (0.1 miles). 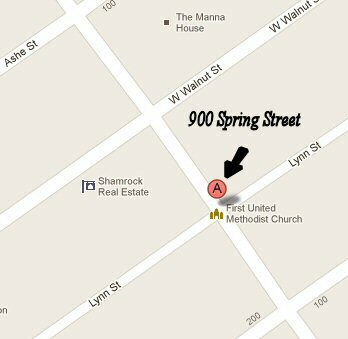 You are at 900 Spring St, Johnson City, TN 37604-6846. Turn right onto State of Franklin toward the Johnson City Medical Center / ETSU. Go to Buffalo Street (at old train depot) and turn right. Go to W. Pine Street and turn left. One of First Church's parking lots is in the middle of that block, you may park on Pine, Spring or Maple Streets, or parking is available in the Maple Street parking lot adjacent to a church annex building which used to be the Holston Conference Office.